Have you ever wondered what crowdsourcing is, what sites on the Internet take advantage of it and its influence online? Well now all your questions will hopefully be answered with this infographic, designed and produced by OBizMedia. What do YOU think about crowdsourcing? Let us know your opinions in the comments. 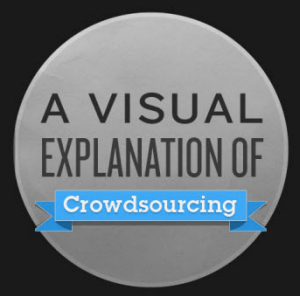 Explore more about: Crowdsourcing, Infographic. Nice infographic. SETI could also be an example of a crowdsourced project. It is the largest distributed computing project in the world after all. I would love to print this as a poster but can't. I'm using a Mac, Tried 'Print', Readability', etc. Does anyone have suggestions on how to do It? Doesn't saving and printing it out as an image work on a Mac? How shocking that driving down the market value of a product or service by not paying 99.99% of the participants results in a lack of quality and efficacy. Good content and well laid out - shocking spelling e.g. vote spelt as vots, their spelt as there, etc. Many would ignore it but I am from the old school. And there are spell and grammar checkers these days. Man, perhaps OBizMedia should have crowdsourced some proofreading for this infographic before they published it. "consumers vots"? "if there design is chosen"? I mean, come on.